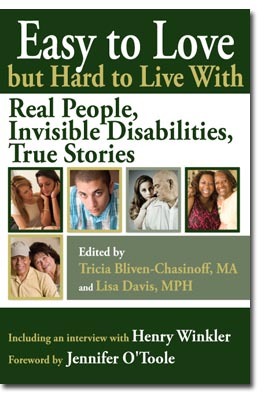 Easy to Love but Hard to Live With : Real People, Invisible Disabilities, True Stories. Edited by Trica Bliven-Chasinoff, MA, and Lisa Davis, MPH. Paperback, Kindle, Nook, e-book. 302 pages. ISBN 978-1-933084-04-6 (pbk). $18.95 (pbk), October 10, 2014. By Mantu Joshi. Paperback, Kindle, Nook, e-book. 162 pages. ISBN 978-1-933084-25-1 (pbk). $11.95 (pbk), January 15, 2014. 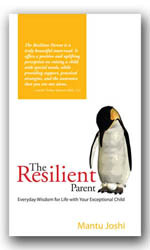 The Resilient Parent combines honesty, humility, and grit with humor and spirituality to offer practical pearls of wisdom for parents of children with special needs. Mantu Joshi, a father of children with neurobehavioral special needs, shares personal and authentic experiences to illustrate ways his fellow parents can find the resilience that is within them – resilience that is absolutely crucial when parenting complicated, behaviorally-challenged children. Drawing from spiritual practices that span the globe as well as from his training as a Methodist minister, Joshi offers slight shifts that create a new framework to view children’s behaviors. These short essays – most which can be read under 5 minutes – boost parents resiliency for a more balanced life. Kay Marner and Adrienne Ehlert Bashista, co-editors; Foreword by Dr. Edward Hallowell, paperback, Kindle, Nook, e-book; 340 pages; ISBN: 978-1-933084-15-2 (pbk); $18.95 (pbk); February, 2012.